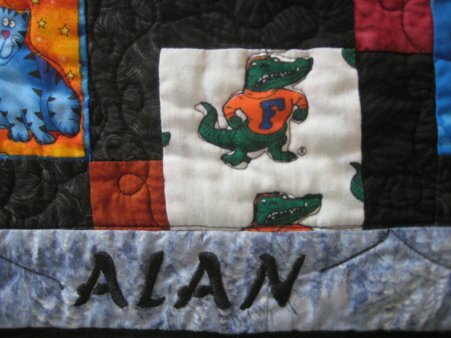 One quilt I wanted to make for Alan Sanders was an interactive quilt ... something that he could eventually play and learn with. An I-Spy quilt was the perfect vehicle! With all the fantastic novelty fabrics available, you can make a generalized I-Spy or a themed I-Spy .. and the layout choices abound. I started research potential layouts. 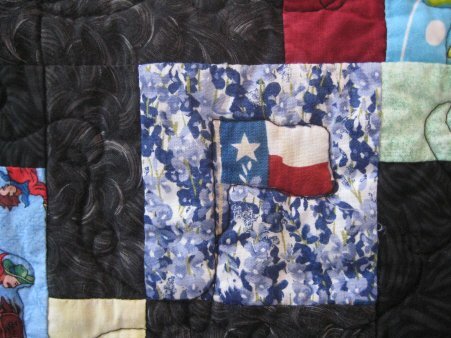 The simplest was to just sew all the novelty fabrics smack dab up against each other, but that seemed so ordinary. I don't like to do ordinary; I like to put some sort of twist to things. 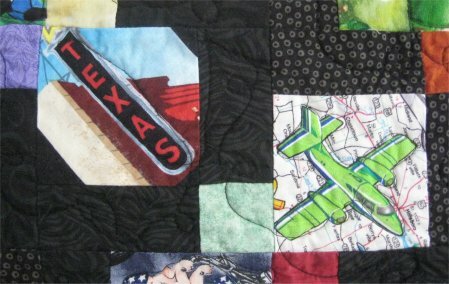 While playing around with Electric Quilt, I designed a layout that combined 4" squares with 2" 4-patches and the 4-patch squares would form a diagonal white line across the quilt. It looks kinda nifty, doesn't it? Well, I'm here to tell you that the theoretical object sometimes does NOT translate well at all into the physical object. My EQ layout called for more than 200 swatches. That wasn't a problem .. I had plenty of novelty squares to choose from! I figured that should keep Alan busy discovering items until he was into grade school. 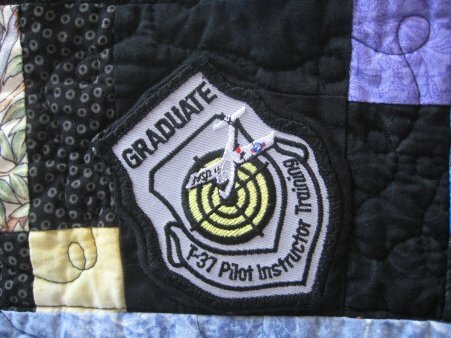 So, I steadily sewed all the patches together and the quilt began to take form on my design wall. 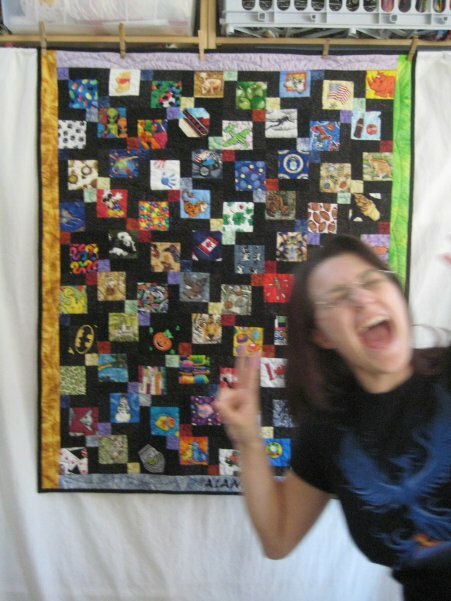 When all the squares were sewn together, I stood back to admire my handiwork. And nearly gagged. Oh my gosh, this thing was horrendous. It was ugly. It was horribly, horribly busy and not in a good way. My poor eyeballs were spinning around. 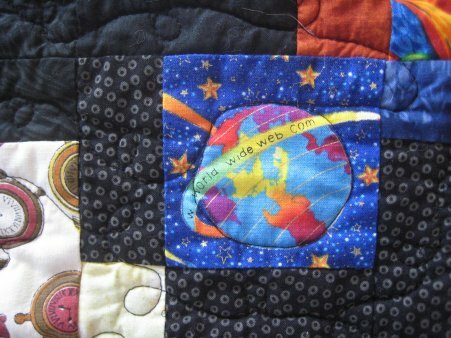 The quilt could have been named "Vertigo". It was sooooo ugly that I didn't even take a picture of it. 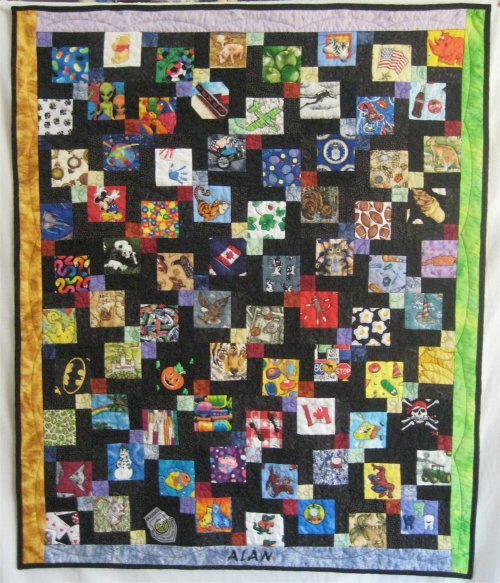 I studied it over the next couple of days, trying to figure HOW such a nifty looking layout in EQ could have produced such an unattractive quilt. Then it hit me (well, not literally) ... even with the white diagonal line (which turned out to be not large enough and therefore didn't have much of an impact), this quilt didn't have any spaces for the eye to rest. There was simply TOO MUCH there. It couldn't be allowed to exist. And so, I painstakingly RIPPED the entire top apart ... down to the point where all I had was the individual 4" squares and 2" squares. Back to the drawing board for a design. 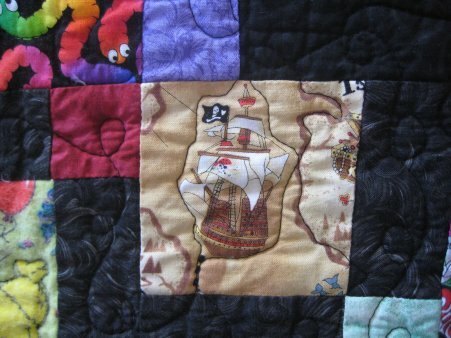 On the quilting forum, a conversation had begun about a new layout called Disappearing 9-Patch. Although 9-patch blocks are as old as the hills, *this* specific arrangement has its origins after the year 2000. It truly is a contemporary layout. And it's so simple! Take an ordinary 9-patch block. Cut it in half horizontally and vertically, creating 4 quadrants. 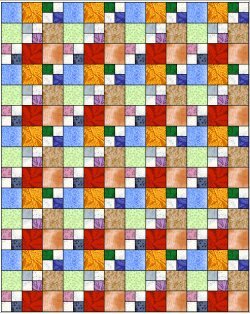 Take 2 diagonally opposing quadrants and turn just those ones 180°. 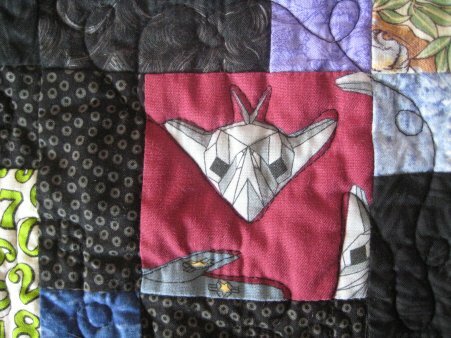 Sew all the quadrants back together. You'd never know this was a 9-patch, hence the name "Disappearing 9-Patch"! Furthermore, if you keep the north-south-east-west squares the same color (shown here in gray), the final block will have built-in resting spaces for your poor abused eyeballs. 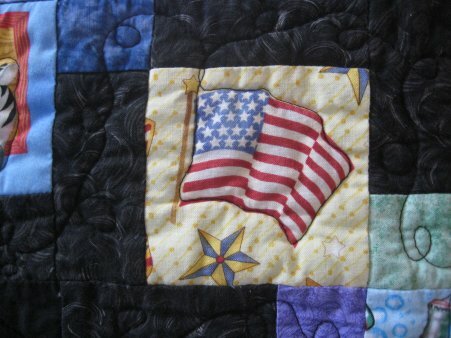 Although I don't particularly care for black in a child's quilt, black really was the only appropriate color to tone down all the different novelty fabrics that I was going to be using. Bananas and pirates and VeggieTales, oh my!